Wyandotte, Wayne County. Looking east along the spur to BASF Corp., on the west shore of the Detroit River. Also, looking east along Alkali Avenue. 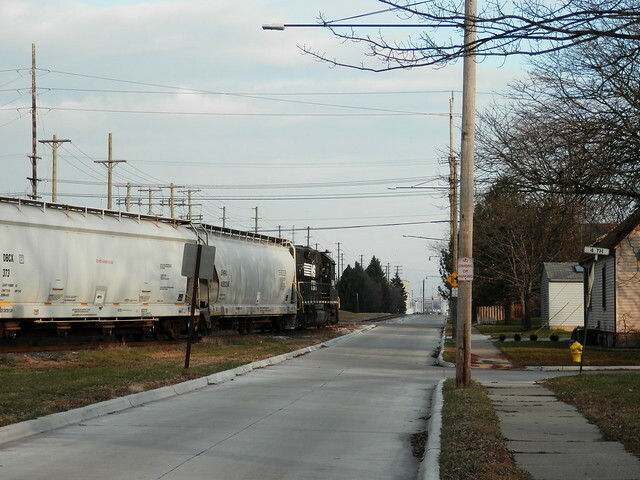 The spur is off the connection with the NS RR Detroit Line. Yep, Alkali and 4th in Wyandotte. US-45 crossing with the E&LS Railroad line, south of M-26 between Mass City and Rockland, MI,in Rockland Township, Ontonagon County, in the da UP! About 20 miles southeast of Ontonagon. Final run of the remaining passenger trains on the former The Milwaukee Road RR line, between Ontonagon and Channing, MI, was made on January 4, 1954. I'm surprised that google apparently has a liberal policy now of imaging private roads/property. While some are hard to distinguish as being private, this area clearly isn't open to the general public. I know where this is. The features in the background looked familiar. It is private property but it appears to be an access road to multiple businesses. I believe there was some court case that opened up private roads like that to being photographed. Dakota Lines on Eckles Rd in Plymouth Township. The signal gantry is for westbounds approaching East Yard Plymouth. Yes, indeed, Dakota Lines on Eckles Road, just south of Schoolcraft Road and I-96 and east of I-275 in Plymouth Township, Wayne County. Top and bottom shots both looking east towards Eckles Road and the middle shot looking south. The spurs are all off the connections with the CSX Plymouth Sub, between I-275 and Eckles Road.